Brand content creation through storytelling and illustration is one of our top assets: With karmaweather® by Konbi, we have created a wolrd leading brand in Feng Shui and astrology in less than 3 years, with more than 2 million visitors a month. At Konbi, we firmly believe that art direction and interaction design (UX / UI design) are the two sides of the same coin. 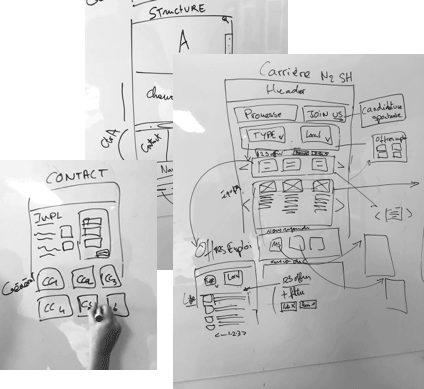 The key to the success of an interactive design project, whether it be a website or a mobile application, lies in the continuous dialogue of information architecture with the artistic direction, and certainly not in the artificial sequencing of tasks. The same goes for the person responsible for the web and mobile development of a project: we consider that the developer is a full-fledged designer whose advice upstream of a project must go well beyond the technical requirements, and extend during production beyond its traditional scope. Konbi studio regularly directs & produces motion design videos and short format ads for Social Media & Youtube broadcasting, with a strong predilection for traditional 2D animation and animation. We embrace graphic design as a language of all 7 senses, used for communicating stories and products, games and services to the wide public of the Internet age. By definition a mixed-media creative process, graphic design has no boundaries, and one could consider a stamp, an animated film, photography or mobile applications as all parts of the same craft. When starting a new project, we discuss with our clients their vision of their brand, who their consumers are today, tomorrow and the day after tomorrow. To translate in time our clients' expectations into the most creative and successful design strategies, products and digital campaigns, we don’t freeze design decisions during production, quickly reshaping projects accordingly when needed. Our job is to create sharp and simple designs and tell universal stories with an original twist. It’s as important for us to understand our clients’ jobs as we think it is for them to have an interest in graphic design process. Dialogue is key to pushing a design to its most accuracy and efficiency. Both clients and designers know mission is accomplished when dialogue is no longer needed. Founder and creative director of Konbi, Charles Lacorne advises clients on their digital strategy and brand development. Charles was awarded first at the 1996 EnsAD entrance examination, France leading Art & Design School in Paris and graduated in 1999 with a BA (Hons) graphic design from London’s Central Saint Martins School. He has an extensive experience in digital communication. In particular, he redesigned the visual identity of the French Yellow Pages in 2007, co-founded the Interactive Designers Association in France, and helped create innovative web and mobile projects at Orange. Eventually, KarmaWeather® is a Chinese astrology and Feng Shui brand he started in 2014, whose global success allows Konbi to position itself as a media, in addition to its historical activity as a graphic design and interactive communication agency. Jing received her BA in Language and Communication at the Polytechnic University of Hong Kong. She then joined an advertising agency where she managed event projects. More recently, she also teamed up with the editors of a fashion magazine in Asia as a stylist. Jing is Konbi studio manager in Hong Kong and managing director of leading Hong Kong creative studio Matches Media Ltd. Matches Multimedia Ltd produces high standard creative works in China, South-East Asia and Japan which successfully blend graphic design, technology, trend, scenography and communication media. Konbi, the Paris based web & mobile communication agency, specialized in website design & digital marketing, is also present in Angers & Hong Kong. Let's get to know each other. In case of spontaneous application, if you do not receive an answer within 10 days of your request, this means that we are not currently recruiting. Thank you for your understanding.